The first panel sought to understand the differentiation between issues of social justice and social mobility and issues of discrimination. It was noted that in the United States, affirmative action methods are viewed to act against discrimination, while in the UK, social justice is seen as the central cause. The difference is in the emphasis of the UK on social mobility over issues of racism it sees as not so embedded in its society. Furthermore, it was discussed that resistance to equality in the legal practice comes from the resistance to giving up power: lawyers hold significant power; and this is economic, political, and educational power. These elements of power then also become means of exclusion of diverse groups from the legal profession. Diversifying economic, political, and educational power chips away at that power. There is also some desire to be more particular about affirmative action targets. For example, there is a discussion of whether African Americans should be grouped with immigrants, particularly black immigrants to the United States. Such a grouping and treatment seems to generalize the goals of the affirmative action policies and also may undermine the nature of African American disadvantage alongside immigrant disadvantage. Regardless of where the two groups, immigrants or African Americans stand in terms of disadvantage, their cases are not equivalent and perhaps deserve more nuanced address. In the United Kingdom, the issues of minority access to the legal profession, particularly black minorities, used to be an issue of class, as well as race. Black lawyers could not get into the chambers, so they formed their own. This phenomenon affects the way in which inclusion in the legal practice happens in the United Kingdom today. However, there is a greater acknowledgement of the necessity of diversity inclusion when working on a world stage, instead of simply a local stage. As for US to UK comparative racisms, the United Kingdom considers itself not necessarily less racist, but racist in a way that is more institutionalized than felt socially. Yet, in both the US and the UK, it was affirmed that issues of inclusion explained by socioeconomic obstacles exist alongside race as a barrier. The second panel discussed more specific institutions that become obstacles to general diversity inclusion in the United States and the United Kingdom. Tests and test preparation, including access to private tutoring, were among the ongoing issues related to social mobility or economic advantages found among non-minorities. In addition, this panel engaged with how to prove lack of equality and bring leaders in the legal profession to take seriously the issues of diversity even when they remain comfortable. 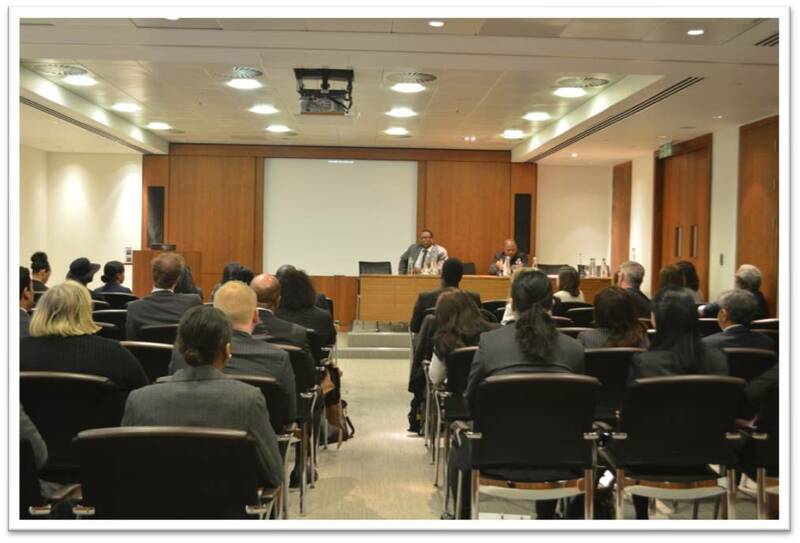 Maintaining the comparison between the United States and United Kingdom, panelists noted that the percent of minorities in legal programs in the UK is greater than the percent of the population as a whole in legal programs. However, in the US, the few numbers of minorities in legal programs is reflective of the population size. In both the US and the UK, blockage comes in taking bar exams and graduating law school. The pipeline after graduation is often limited by money, wealth, and connection. In the United Kingdom, legal institutions argued they were making selections based on qualifications, and could not be asked to “lower the bar” for diversity inclusion. However, when minority cases of equal qualification were presented as having one-seventh of a chance of employment, institutions began to realize they were in fact making choices based on race and ethnicity. The acknowledgement was key, but even as lower-level, entry positions become more diverse, the partner level and Chambers look for themselves in applicants, and these levels become exclusive. Furthermore, a panellist cited the statistic all the elite institution in the UK combined have less black students than the London Metropolitan University on its own. Alongside the statistic that two thirds of barristers and three fourths of judges attended fee-paying, private institutions, black employment can be clearly impeded by an issue of social mobility. Likewise, in the US, lower-income minority students tend to attend lower-cost law schools, and while there are about 200 accredited law schools, top law firms typically take students from the top 10-25 law schools exclusively. Related to this exclusion is the need identified to “speak to the pocket” of leadership and partners in both the US and the UK. The point must be promoted on the level of raising awareness of inequality, but additionally creating an understanding that promises either an increase in wealth, or no decrease in wealth to become more diverse and inclusive. With more diverse clientele, it must simply make sense to create a more diverse firm and leadership. 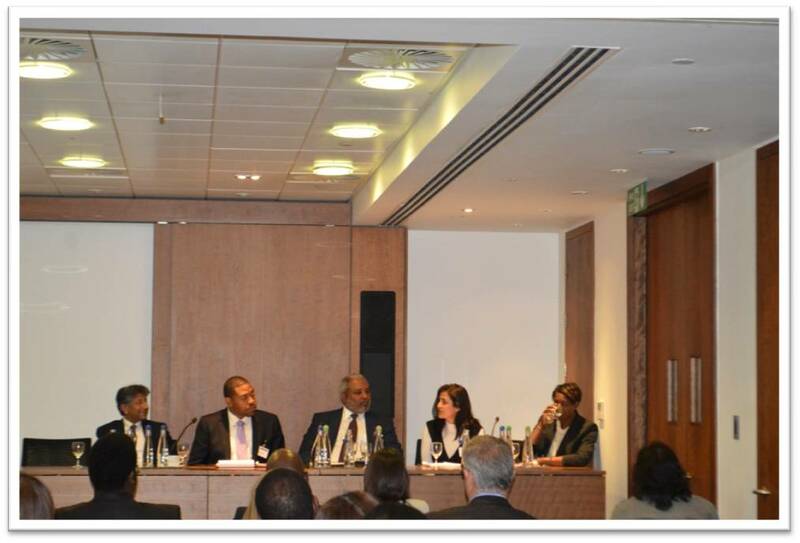 Panelists were quick to elaborate and clarify that diversity within diversity should likewise be acknowledged. The matter of women’s inclusion and disability inclusion varied from black inclusion or Asian inclusion. In fact, sometimes Asians in the US and Indians in the UK have “positive bias” associated with a tendency to perform better in school for various reasons. In the US, African Americans became discouraged by the filling of minority “slots” by South Asians, or Asians. The issues of exclusion must therefore be considered carefully and contextually. In the US, bias can exist at the level of names, and some minorities attempt to opt for neutral middle names to avoid the initial bias. Additionally, minority inclusion has encountered a question of if universities will often have a “tipping point” or general number of slots for minorities, but would be questioned for “too many” minorities admitted or attending. On the hand, low numbers cause minorities to feel vastly underrepresented. Some solutions attempted in both the UK and the US are blind applicant-review and interview processes. In Boston, dedicated minority job fairs also aimed to address disparities in call-backs among minorities and Caucasians in general application processes. Networking also becomes of greater importance, so that minorities may spend 3-4 years at a smaller firm networking before courting a larger firm. Lastly, in the United Kingdom, many hope that greater social diversity will naturally foster upcoming leaders and professionals who will seek to mirror society in their workplace. However, advocates are wary that social diversity creates an assumption of general inclusivity and can eclipse diversity-inclusion efforts. In the United States, panellists agreed that raising awareness of the micro-aggressions and experience of “unconscious bias” of minorities through personal stories can bring the issue forward when the status quo is thus opposed more popularly.